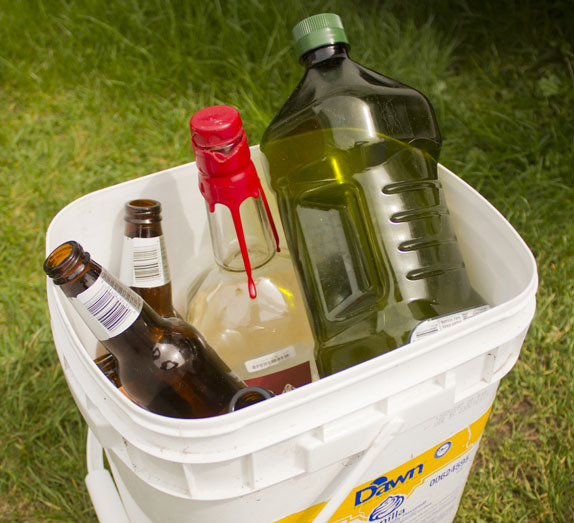 If you’ve ever had problems with recycle bin thieves, or just don’t have the room to keep one, it can be smart to use instead a fabulous free 5 gallon bucket or two. Just make sure that when you leave your bucket recycling bin at the curb your friendly pickup people don’t throw the bin in with everything else! Buckets come in many different dimensions, so you can pick a spot for your recycling bin, then find the right bucket for the job. 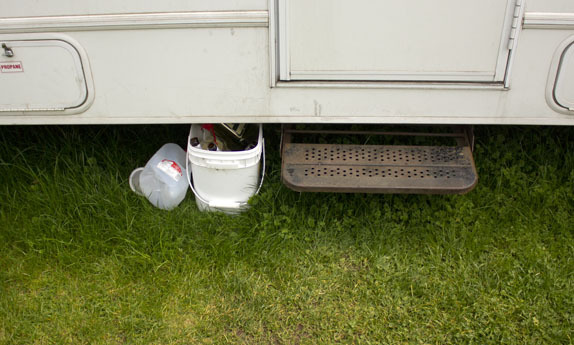 A small square 5 gallon recycling bin can easily tuck into a small space on the front step or entryway in an apartment or on the grass underneath an RV. If it’s outfitted with a handle, you could even hang your recycling from your kitchen window ledge. One excellent idea I’ve stolen from standard recycling bins, like the blue bin pictured below, is to stab some drainage holes in the bottom. I do the same for garbage cans that sit outside. 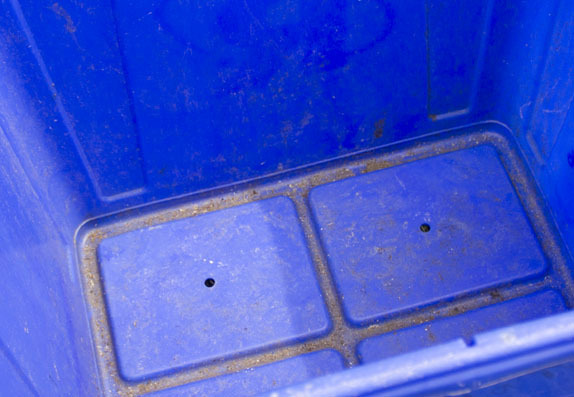 When it rains, the water trickles through the recycling and out onto the ground, preventing a buildup of rainwater that just makes everything more difficult for you or your garbage collector. At times, we’ve gone even simpler and just used big cereal or cat litter boxes to keep recyclables in. Typically the collectors will just toss the whole thing in their truck which is just fine – there seems to always be another empty box lying around.